Karelian-Finnish Soviet Socialist Republic existed as a part of the USSR from March 31, 1940 to July 16, 1956. KFSSR was created on the basis of the Karelian Autonomous Soviet Socialist Republic by merging it with the territories seized by USSR from Finland as result of the Winter War of 1939-1940. KFSSR became the twelfth union republic of the Soviet Union (together with Russian Soviet Federative Socialist Republic, Armenian, Azerbaijan, Belarusian, Georgian, Kazakh, Kirghiz, Tajik, Turkmen, Ukrainian and Uzbek Soviet Socialist Republics). In August 1940, after the annexation of the Baltic states and Bessarabia, were incorporated into the USSR Moldovan, Latvian, Lithuanian and Estonian Soviet Socialist Republics. Until July 16, 1956 USSR was composed of sixteen union republics. 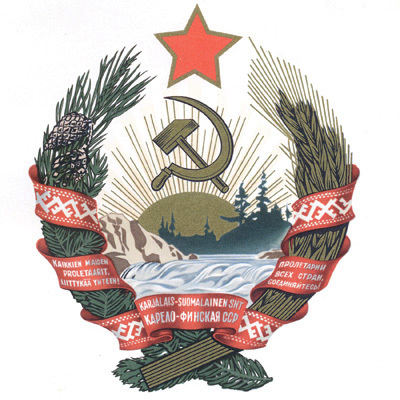 From June 26, 1946 to September 12, 1956 the coat of arms of the USSR contained a ribbon bearing the motto «Kaikkien maiden proletaarit, liittykää yhteen!» («Workers of All Countries, Unite!» in Finnish). Soviet notes of 1947 (issued in the same 1947 year) contained a face values also by Finnish. For example, «yksi rupla» («one ruble») or «viisikymmntä ruplaa» («fifty rubles»). KFSSR had its own flag, coat of arms and national anthem. Petrozavodsk was a capital of KFSSR. The Chairman of the Presidium of the Supreme Soviet of KFSSR from July 9. 1940 to July 16. 1956 was Otto Kuusinen. In 1941-1944, a most of the territory of the KFSSR, including the capital Petrozavodsk, was occupied by Finnish and German troops. Belomorsk was a temporary capital of the KFSSR. At November 24, 1944 the part of territory of Karelian Isthmus (including the cities of Vyborg and Kexholm), which was incorporated into KFSSR, was transferred to the Leningrad region of the RSFSR. At February 24, 1955 the territory of Alakurtti was transferred to the Murmansk region of the RSFSR. At July 16, 1956 the KFSSR was transformed back to the Karelian Autonomous Soviet Socialist Republic and was incorporated into the RSFSR.